Our parenting book is a helpful tool for teaching kids business. Parenting strategies are important to teach life skills and prepare your children for independence. 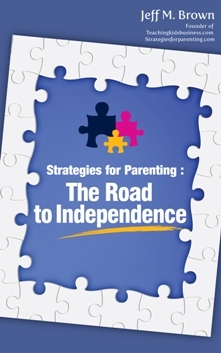 This book helps parents develop strategies to develop life skills in children to prepare them for independence. This book is a collaborative effort among a husband, wife, son, and daughter to demonstrate the necessary involvement of parents and children for effective parenting strategies. Authors use a unique combination of guiding points and real-life stories to provide key learning in a thought-provoking yet simple way. The book has unique subject matter and touches on a very diverse array of perspectives, from parents, children, working professionals, teachers, mentors, sports psychology, and observational research. This book will engage parents and children to have healthy discussions and debates. This will foster communication, understanding, and agreement within the household in a timely and effective manor to eliminate many avoidable parenting problems. Both of the online bookstores have a gift program to allow you to purchase this book as a gift – choose the “gift giving” option.